BREAKING: The Janus decision is out. This morning the Supreme Court ruled against workers in a 5-4 decision. Something’s happening in America, workers are on the rise and the Supreme Court can’t stop us. From Boeing workers organizing in the South, to teachers taking a stand in Oklahoma, North Carolina, West Virginia and Arizona, to Las Vegas workers winning industry setting contracts that deal with automation, AT&T workers standing up to stop outsourcing – working people are on the move, standing together and fighting for our union rights and a stronger America for all. Today’s Supreme Court Janus decision is a step backwards in the forward progression of our country, but workers will continue to stand together in our long march for social and economic justice for all. American workers will not be divided by any court case or other attack on our unity. While the billionaires and the corporate interests behind the Janus case use their power and wealth to continue to rig our economy against working people, workers are busy building a movement to rewrite the rules of our economy to create broadly shared prosperity. Click here to pledge to continue to stand in unity and support union rights in the face of political attacks. Solidarity is our strength! Unions bring a necessary balance to our economy by putting a check on corporate power and greed. At a time when our democracy and economy are rigged to overwhelmingly favor the wealthy, America needs unions now more than ever so our middle class can thrive. The Wisconsin labor movement recommits today, tomorrow and every day to fight on behalf of America’s workers. Stand with us, take the pledge today. BREAKING: Janus decision is out. In a 5-4 decision, court rules against working people and the freedom to collectively bargain. Today, the Supreme Court decided against workers in a 5-4 decision. The political attack at the Supreme Court in the case Janus v. AFSCME Council 31 threatens to undermine worker freedoms and rig our democracy and economy even further against working people. Mahlon Mitchell is leading a historic and exciting campaign for Governor by uniting Wisconsinites from all corners of the state around a working families agenda. Mahlon Mitchell gets the issues that matter most to working families in Wisconsin: economic opportunity, higher wages, safe jobs, a secure retirement and a fair return on our hard work. "As president of my union, after I take off my turnout coat, I go to work on behalf of men and women who run into burning buildings, those who respond to medical emergencies around our state - for their hours, wages, working conditions and their health and safety. What I do is helping people of this state and that's what I want to do as governor." Mahlon Mitchell is the best gubernatorial candidate to lead Wisconsin. Get to know Mahlon and get ready to vote Mahlon Mitchell on August 14. And on Tuesday, June 12, our endorsed candidate, Caleb Frostman, won the special election in Senate District 1 in northeast Wisconsin. Remember, Scott Walker did everything he could to try to stop this election from happening, and it’s clear why – our candidate won big. It’s the second Senate district to flip to a union-endorsed candidate in the last few months, and means the Republican advantage in the Senate has been cut in half. We have momentum for working families in Wisconsin. We need more leaders who care about our values of raising wages, safe jobs, economic opportunity for all and a better tomorrow for our children. 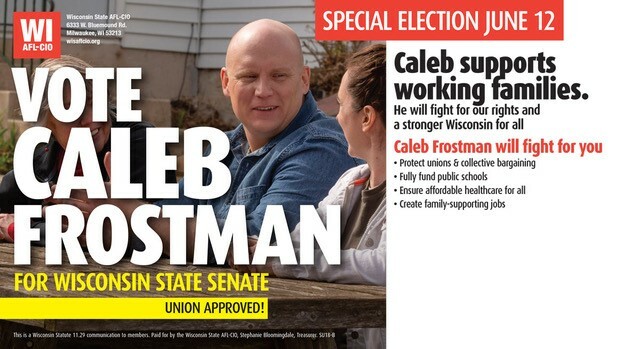 Caleb Frostman has promised to be the kind of Senator we can trust. But this special election is just one step. We still need to elect Caleb again this fall, and we need to flip at least two more Senate seats. That’s how we uphold the Wisconsin values of protecting union rights, fully funding our schools, supporting prevailing wages and project labor agreements, and creating good family-supporting jobs for the people of Wisconsin. 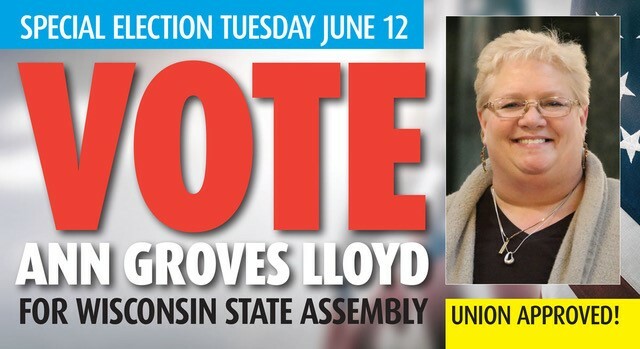 We also want to thank our union sister, Ann Groves Lloyd, who ran a spirited campaign in Assembly District 42, a rural district in central Wisconsin. Both Ann and Caleb saw massive improvement over the 2016 and 2014 results. And Ann is also on the ballot again this fall, so we’re going to keep working to get her over the top. For the rest of this year, we will be working hard to win for Caleb, Ann, and everyone we endorse, including our union brother, Mahlon Mitchell, for Governor. We’ll keep knocking doors. We’ll keep making phone calls. We’ll keep talking to our co-workers and neighbors. If we work hard together, we can win for working families. It is special election day in Wisconsin with close races in Senate District 1 and Assembly District 42. The Wisconsin AFL-CIO has endorsed Caleb Frostman in Senate District 1 and Ann Groves Lloyd in Assembly District 42. Polls are open from 7:00 a.m. to 8:00 p.m. Lookup your polling place. Be sure to bring a valid photo ID. You can still register to vote today with proof of residence. Grab your friends and family and head to the polls. Check to see if any neighbors need assistance getting to their polling location. The time is now to continue to build momentum for working families in Wisconsin. We need leaders who care about our values of raising wages, safe jobs, economic opportunity for all and a better tomorrow for our children. Caleb Frostman and Ann Grove Lloyds will uphold the Wisconsin values of protecting union rights, fully funding our schools, supporting prevailing wages and project labor agreements and creating good family-supporting jobs for the people of Wisconsin. Help working families get out the vote. Stop into one of our volunteer locations below to make phone calls or knock doors in support of our endorsed candidates. Volunteer Tuesday June 12 at USW District 2 Office, 1244 Midway Rd. Menasha from 9am-8pm. Volunteer Tuesday June 12 at the Madison Labor Temple, Room 212, 1602 S. Park St. Madison from 10am-8pm. The Wisconsin State AFL-CIO announced today its endorsement of Tammy Baldwin for U.S. Senate. Ready, set, vote! After months of Gov. Walker delaying democracy, Wisconsinites in Senate District 1 and Assembly District 42 are finally getting the chance to fill vacant seats in our Wisconsin legislature. The special election in these two districts is set for Tuesday, June 12, 2018. This is a great opportunity to restore some balance to the state legislature, elect politicians who care about creating family-supporting jobs and get Wisconsin working for the people again. 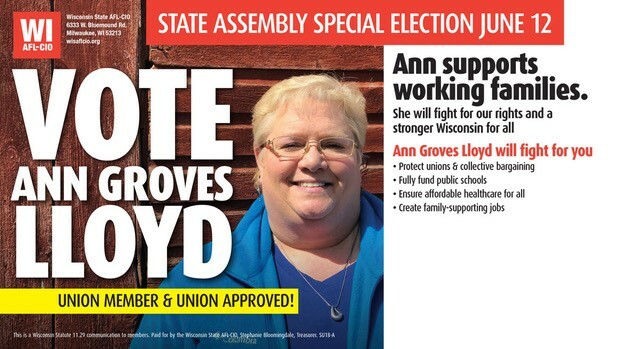 Ann Groves Lloyd in Assembly District 42. Ann Groves Lloyd is an American Federation of Teachers union member. Caleb Frostman in Senate District 1. Caleb Frostman is an avid outdoorsman who has worked with the Door County Economic Development Corporation. Both candidates will protect union rights and collective bargaining, fully fund our neighborhood public schools, fight for affordable health care, support prevailing wage and project labor agreements and prioritize job creation with good wages. Have your say in democracy and vote on Tuesday, June 12. 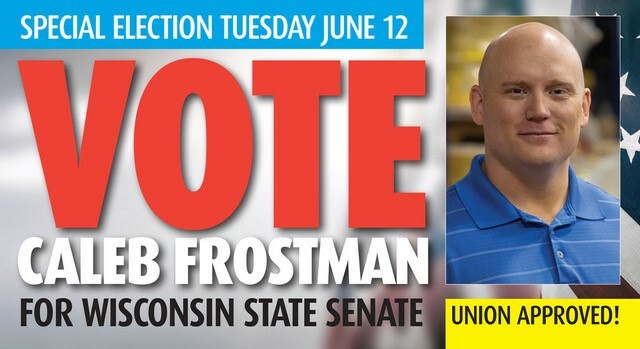 Don’t miss a very special Get Out the Vote Canvass with Special Guest: Caleb Frostman on Saturday, June 9 from 10am-4pm at USW District 2: 1244 Midway Rd., Menasha. Rally with Mahlon in Madison Monday! Join International Association of Fire Fighters President Harold Schaitberger and Wisconsin AFL-CIO President Phil Neuenfeldt for a rally with fire fighters and Wisconsin workers in support of gubernatorial candidate Mahlon Mitchell. Click here for a rally flyer! Working people are energized for the November election and we are starting now as we support fire fighter Mahlon Mitchell as the best candidate for Governor. Mahlon Mitchell will protect union rights, raise wages for working families and bring people together to create a fair economy where working people can get ahead. Mahlon Mitchell will focus on good job creation, not special interest giveaways. VOTE NOW: Help Mahlon Mitchell in the next round of the Wisconsin’s Choice People’s Champion. Voting is open until Thursday night. VOTE HERE: Let’s get Mahlon into the third and final round -- cast your vote before Thursday at 10:00 PM for Mahlon Mitchell, Wisconsin’s Choice for governor! Vote in the poll and then join us in Madison on Monday for a special rally with IAFF President Harold Schaitberger and Wisconsin AFL-CIO President Phil Neuenfeldt. With help from local Wisconsin unions, labor councils and building trades councils, Union Sportsmen’s Alliance Work Boots on the Ground ‘Take Kids Fishing Day’ events were held over the June 2-3 weekend in La Crosse, Eau Claire, Janesville and Madison. The events gave hundreds of Wisconsin children the chance to enjoy the thrill of baiting hooks, eating a picnic lunch, taking home prize giveaways – and reeling in some nice fish! All fishing events were free and open to the public thanks to the generous volunteerism, sponsorship and support of the Western Wisconsin AFL-CIO, the South Central Wisconsin Building and Construction Trades Council, the Western Wisconsin Building and Construction Trades Council, the Southern Wisconsin Building and Construction Trades Council and the Greater West Central Area Labor Council. For many of the kids who came out to fish, it was their first time holding a fishing rod or touching a fish. Union volunteers showed young people the ropes of fishing and how to be respectful of nature while enjoying Wisconsin’s beautiful outdoors. For many participants, access to fishing bait and gear would be hard to come by without the generous donations of local union members and labor councils. Take Kids Fishing Day is a great way to educate young people in the community on the benefits of fishing and spark a lifelong interest in the sport. Dave Branson, Executive Director of the Building and Construction Trades Council of South Central was on hand at Tenney Park in Madison where over 205 kids signed up to learn how to fish! Lola Anton, 10, of Madison caught her fish at Tenney Park on Saturday with the guidance of Jim Foye, Laborers 464. “I’ve been fishing once or twice before but didn’t catch anything,” explained Lola. “This is my first fish. It was fun. I was really overwhelmed.” Lola had no problem baiting the worm and searching out a fish bed thanks to instruction from Jim Foye, a Take Kids Fishing Day volunteer with LIUNA Local 464 who offered up tips and tricks for getting the fish to bite. “Helping kids catch their first fish and giving them an idea of how to go about it is a great life lesson,” said Foye. Robert Potter, Heat and Frost Insulators Union Local 19, was at Traxler Park in Janesville where 150 children attended the Take Kids Fishing event. These free events are staffed entirely by volunteers from the labor community and are a prime example of the value of introducing youth and their families to a healthy, outdoor pastime and the value of union members in our communities. A union-made picnic lunch was provided. For more pictures of events in La Crosse, Eau Claire, Janesville and Madison, click here.